The Moormanair DC-3 was chartered to fly Ajax football supporters back to the Netherlands. 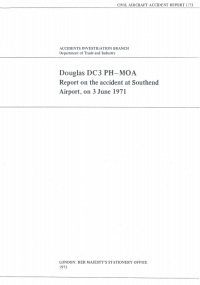 Following a fall in manifold pressure and the discovery of an oil leak in the starboard engine soon after a night takeoff the pilot decided to return to Southend Airport for an emergency landing. In order to avoid an overshoot he used 15 degrees of flap for the landing which resulted in a higher than normal airspeed at touchdown. The aircraft touched down about half-way along the runway in use, overran the paved area and collided with an earth bank. Of the thirty-two passengers and four crew on board the aircraft, two passengers were injured. The aircraft was substantially damaged. CAUSE: "The accident was due to a late touchdown and inappropriate use of the flaps. Insufficient braking efficiency resulted in a higher speed of overrun than would have otherwise occurred." Distance from Southend Municipal Airport to Amsterdam-Schiphol International Airport as the crow flies is 289 km (180 miles).